These are original disbound sections removed from Congressional Records, (pages only, without covers) relating to the Services. They are very interesting reading and contain much valuable information in text as well as some tables or illustrations. 3170e,f,g. REPORT FROM THE SECRETARY OF THE NAVY TRANSMITTING A REPORT...IN RELATION TO THE ERECTION OF LIGHTHOUSES....Senate Doc. 38, December 22, 1837. 96pp. Examines 31 proposed lighthouses throughout the country, listing various recommendations relating to the structures, locations, type of beacon, as well as the perceived need. Includes testimony from various mariners and other persons both in support and against each proposed light. Quite detailed, important early reference. Includes lighthouses on the east coast and Great Lakes. $22. 416. LETTER FROM THE TREASURY DEPARTMENT TRANSMITTING STATEMENTS OF PAYMENTS MADE AT THE TREASURY DURING THE YEAR 1823 FOR THE DISCHARGE OF MISCELLANEOUS CLAIMS...OF CONTRACTS MADE BY COLLECTORS FOR THE REVENUE SERVICE....AND OF CONTRACTS MADE FOR OIL, LIGHT-HOUSES, BUOYS, &c. February 20, 1824 . 10pp with 2 fold-out plates. Disbound. Very early report includes amounts in the districts for rations and supplies for the Revenue Cutter Service, and expenditures for contracts for light-houses, oil, beacons, buoys, etc. Clean, without wraps. $24. 465. H.R. Doc. No. 158. BUILDING LIGHT-HOUSES, LIGHT-BOATS, BEACONS, &c. February 6, 1839 . 19pp. Includes recommendations on Whale’s Back Light, Saddleback Ledge, Plymouth Gurnet Light, Chatham Twin (wooden) Lights, Reedy Island, Louis McClain Light-boat (Michigan - lost in a gale with all hands), Florida lights and others. Rare early information, disbound from Congressional Record. $22. 825. H. R. Doc. No. 27. LIGHT-HOUSES, BUOYS, &c., INFORMATION UPON THE SUBJECT OF EXECUTING THE LAW FOR BUILDING LIGHT-HOUSES, BUOYS, &c. December 14, 1837 . 27p. Contains a complete listing of lighthouses and beacons with the number of lamps lit as of the first day of January, 1833. Also contains an extensive account of approved and rejected light-house construction projects in the states of Maine, New Hampshire, Mass., Conn., Rhode Island, New York, Jew Jersey, Penn., Del., Maryland, Virginia, North and South Carolina, Georgia, Alabama, and Great Lakes, etc. Extensive early information, disbound from Congressional Record. $28. 6462. H. R. Ex. Doc. No. 52. A REPORT RESPECTING LIGHT-HOUSES. March 3, 1851 . 5p. Reports on a number of sites proposed for light-houses including Saddle-back Rock, Maine, Egg Rock, Nahant, Bass River, Sow-and-Pigs Reef, Fire Island inlet, Monaskonk Shoal, Mississippi City, Pascagoula River, and Port Ular. Rare early information, disbound from Congressional Record. $16. 5256. H. R. Doc. No. 32. LETTER FROM THE SECRETARY OF THE TREASURY COMMUNICATING INFORMATION IN RELATION TO THE REMOVAL OF THE LIGHT VESSEL FROM BRANDYWINE SHOAL TO TUCKERNUCK SHOAL. January 12, 1828 . 7p. Very early reply from the Secretary of the Treasury to the House if Representatives informing them that the light vessel has not been removed from Brandywine Shoal. It was the intention to remove the vessel when the lighthouse being built at that location was completed. However, in November of 1827 a storm arose, causing such damage to the lighthouse that it could not be lit, and thus the need for the vessel. Includes quite a bit of information on the construction and condition of the early lighthouse at this location. $28. 4408. H.R. Doc. No. 22. WRECK OF SCOTLAND LIGHT-SHIP. A Resolution of the House of December 13, 1870 , relative to the wreck of the Scotland Light-ship. 8pp. Offers information and testimony as to the necessity of retaining said light-ship on station, the need to construct a new vessel, etc. $12. 29229. H. R. Rep. No. 76. Payment of Sums for Repairs Done at Light Keeper’s Dwelling at Gibralter, Mouth of Detroit River . January 20, 1843. 1p. Petitioner requests payment of sums for repairs done to light-house dwelling which was commandeered by the U.S. Military before it could be accepted by the Superintendent of Light-Houses. Includes additional information and supporting testimony. $14. 9387a,b. H. R. Report No. 1302. OPERATIONS OF THE LIGHT-HOUSE BOARD OVER THE ILLINOIS RIVER. March 21, 1888. 2p. Report presents evidence in support of the extension of the lighting operations and jurisdiction of the Light-House Board over the 200 mile Illinois River. $9. 9381. H. R. Report No. 1296. LIGHT-HOUSE AT [SQUAN INLET] A POINT ABOUT MIDWAY BETWEEN BARNEGAT AND NAVESINK LIGHTS, IN NEW JERSEY. March 21, 1888. 1p. Report presents evidence in support of a lighthouse at or near Squan Inlet, New Jersey. and notes that the sum of $20,000 be sufficient for the proposed light. $12. 9366. H. R. Report No. 1307. LIGHT AT THE MOUTH OF OTTER CREEK, LAKE CHAMPLAIN. March 21, 1888. 2p. Reports on the need for a light-house at the mouth of Otter Creek, shipping traffic in the area, and recommends the passage of said bill with amendments. $10. 9385. H. R. Report No. 1300. AIDS TO NAVIGATION IN CHARLOTTE HARBOR, FLA.. March 21, 1888. 2p. Report details the need for a light of lights to guide shipping into Charlotte Harbor, Florida. The report details the situation and requests that $40,000 previously appropriated be used to erect a light at or near Dog Island, west of the Crooked River. A lighthouse previously erected here was destroyed by a hurricane in 1873. $16. 9386. H. R. Report No. 1301. AIDS TO NAVIGATION AT THE MOUTH OF THE MISSISSIPPI RIVER. March 21, 1888. 1p. Report reduced the amount previously appropriated to provide better lights on the Mississippi River below New Orleans. Includes establishing lights at the end of South Pass Jetty, a fog signal at the East Jetty, and a higher and more powerful light on one of the jetties. Also the report begs a fog signal be established near Cubits Gap, etc. $12. 9382. H. R. Report No. 1295. EXTENSION OF JURISDICTION OF LIGHT-HOUSE BOARD. March 21, 1888. 2p. Report recommends the extension of the jurisdiction of the Light-House Board to the Sacramento and Joaquin Rivers in California. $9. 9365. H. R. Report No. 1309. ESTABLISHING A LIGHT OFF PAMPLICO POINT, NORTH CAROLINA. March 21, 1888. 2p. Reports on the need for a screw-pile light-house on the shoal near Pamplico Point, North Carolina, and recommends the passage of said bill. The report notes that the present light-house structure on Pamplico Point is in danger of being washed away and so has been discontinued, and that a light on the shoal would be much greater value. $12. 730a,b. H. R. Ex. Doc. No. 304. May 10, 1888. LIGHT AND FOG SIGNAL AT PUNTA GORDA, CAL. AN ESTIMATE FROM THE LIGHT-HOUSE BOARD OF APPROPRIATION FOR THE ESTABLISHMENT OF A LIGHT AND FOG SIGNAL AT PUNTA GORDA, CAL. 2pp. Includes arguments for and description of necessary steps to be taken, with cost estimate. $10. 731a,b. H. R. Ex. Doc. No. 328. May 23, 1888. LIGHT AND FOG SIGNAL AT STUART ISLAND, WASHINGTON. AN ESTIMATE FROM THE LIGHT-HOUSE BOARD OF APPROPRIATION FOR A LIGHT AND FOG SIGNAL AT STUART ISLAND, WASHINGTON TERRITORY. 2pp. Includes arguments for and description of necessary steps to be taken, with cost estimate. $10. 732a,b. H. R. Ex. Doc. No. 329. May 23, 1888. LIGHT AND FOG SIGNAL AT POINT BUCHON, CALIFORNIA. AN ESTIMATE FROM THE LIGHT-HOUSE BOARD OF APPROPRIATION FOR A LIGHT AND FOG SIGNAL AT POINT BUCHON, CALIFORNIA. 2pp. Includes arguments for and description of necessary steps to be taken, with cost estimate. $10. 733a,b. H. R. Ex. Doc. No. 330. May 23, 1888. LIGHT AND FOG SIGNAL ON PATOS ISLAND, WASHINGTON. AN ESTIMATE FROM THE LIGHT-HOUSE BOARD OF APPROPRIATION FOR A LIGHT-HOUSE AND FOG SIGNAL ON PATOS ISLAND, WASHINGTON TERRITORY. 2pp. Includes arguments for and description of necessary steps to be taken, with cost estimate. $10. 734a,b. H. R. Ex. Doc. No. 332. May 23, 1888. LIGHT AND FOG SIGNAL AT POINT ARGUELLO, CALIFORNIA. AN ESTIMATE FROM THE LIGHT-HOUSE BOARD OF APPROPRIATION FOR A LIGHT AND FOG SIGNAL AT POINT ARGUELLO, CALIFORNIA. 2pp. Includes arguments for and description of necessary steps to be taken, with cost estimate. $10. 735a,b. H. R. Ex. Doc. No. 351. June 9, 1888. A COMMUNICATION FROM THE LIGHT-HOUSE BOARD RELATIVE TO THE ESTIMATE FOR REPAIRS OF LIGHT-HOUSES. 2pp. Includes arguments for re-inserting the necessary clause into appropriations to allow "necessary new structures" to be built from funds appropriated under the heading "repairs and incidental expenses", as has been the practice in the past. $5. 9369. H. R. Report No. 2542. LIGHT-HOUSE ON THE HIGHLAND TO THE WESTWARD OF CROOKED RIVER, FLORIDA. June 9, 1888. 2p. Reports on the need for a light-house at or near Dog Island, Florida, and recommends the passage of said bill with amendments. Said light had been erected on the site in 1838 but was destroyed by a hurricane in September, 1873. $12. 736b,c. H. R. Ex. Doc. No. 354. June 12, 1888. LIGHT AND FOG SIGNAL AT CEDAR POINT, MARYLAND. AN ESTIMATE FROM THE LIGHT-HOUSE BOARD OF APPROPRIATION FOR THE ESTABLISHMENT OF A LIGHT AND FOG SIGNAL AT CEDAR POINT, MOUTH OF PATUXENT RIVER, CHESAPEAKE BAY, MARYLAND. 2pp. Includes arguments for and description of necessary steps to be taken, with cost estimate. $10. 737b. H. R. Ex. Doc. No. 362. June 16, 1888. LIGHTS ON THE CONNECTICUT RIVER. AN ESTIMATE FROM THE LIGHT-HOUSE BOARD OF APPROPRIATION FOR THE ESTABLISHMENT OF LIGHTS AND OTHER AIDS TO NAVIGATION ON THE CONNECTICUT RIVER, FROM ITS MOUTH TO HARTFORD, CONN. 2pp. Includes arguments for and description of necessary steps to be taken, with cost estimate. $10. 738a,b. H. R. Ex. Doc. No. 369. June 22, 1888. LIGHT AT CEDAR POINT, GREEN BAY, MICHIGAN. AN ESTIMATE FROM THE LIGHT-HOUSE BOARD OF APPROPRIATION FOR A LIGHT AT CEDAR POINT, MOUTH OF CEDAR RIVER, GREEN BAY, MICHIGAN. 2pp. Includes arguments for and description of necessary steps to be taken, with cost estimate. $10. 739a,b. H. R. Ex. Doc. No. 370. June 22, 1888. LIGHT-SHIP WITH FOG SIGNAL ON PACIFIC COAST. AN ESTIMATE FROM THE LIGHT-HOUSE BOARD OF APPROPRIATION FOR A LIGHT-SHIP WITH FOG SIGNAL APPARATUS OUTSIDE THE BAR OF THE COLUMBIA RIVER, PACIFIC COAST. 2pp. Includes arguments for and description of necessary steps to be taken, with cost estimate. $10. 9375. H. R. Report No. 2732. FOG-SIGNAL NEAR BALLAST POINT, CALIFORNIA. June 23 1888. 1p. Reports on the need for a light-house and fog-signal on or near Ballast Point, entrance to San Diego Bay, California, and recommends the passage of said bill with amendments. Said light had been erected on the site in 1838 but was destroyed by a hurricane in September, 1873. $12. 9374. H. R. Report No. 2737. LIGHT-SHIP OFF GREAT ROUND SHOAL. June 26, 1888. 1p. Short reports recommends the passage of a bill to establish a light-vessel off Great Round Shoal in Nantucket Sound, Massachusetts. $12. 740a,b. H. R. Ex. Doc. No. 380. June 29, 1888. LIGHTS TO GUIDE INTO THE MOUTH OF PASCAGOULA RIVER, MISSISSIPPI. AN ESTIMATE FROM THE LIGHT-HOUSE BOARD OF APPROPRIATION FOR RANGE-LIGHTS TO GUIDE INTO THE MOUTH OF PASCAGOULA RIVER, MISSISSIPPI. 2pp. Includes arguments for and description of necessary steps to be taken, with cost estimate. $10. 9371. H. R. Report No. 2985. COL. JAMES C. DUANE. July 20, 1888. 5p. Unusual report seeks relief from losses due to thefts and forgeries by Henry J. Buete, a clerk in the office of the engineer of the Third Light-House District on Staten island. Buete was appointed clerk in 1874 and subsequently was found to have committed the above offenses. Includes a great amount of detail as to the offenses and methods which Mr. Buete used to carry out his deeds. $22. 20255a,b. H. R. Report No. 3499. LIGHT-HOUSE AT POINT ISABEL, TEXAS. September 25, 1888. 2pp. Includes arguments for and estimates of appropriations for re-establishing the light-house at Point Isabel, Texas. $9. 9388. H. R. Report No. 3388. RELIEF OF WORKMEN EMPLOYED ON POVERTY ISLAND LIGHT-HOUSE. September 1, 1888. 2p. On October 25, 1873 there occurred on Poverty Island, Lake Michigan, a fire which damaged the sleeping and dining rooms, stores and provisions in the quarters of the construction workers who were employed constructing the light-house there. The fire began while workers were at work on the light-house, and though they attempted to control the blaze, they could not. This bill requests reimbursement for the losses sustained by the workers, who labored through the night to keep the fire from spreading to other public buildings on the site, at the loss of their own belongings. $14. 9377. H. R. Report No. 3628. LIGHT-SHIP WITH A FOG-SIGNAL AT SANDY HOOK. December 19, 1888. 1p. Short reports the passage of a bill to establish a light-vessel off Sandy Hook, but notes that said bill failed to become law because it reached the President to late for his signature. $10. 20351. H. R. Report No. 763. FOG-SIGNAL AT MARTIN’S INDUSTRY SHOAL. March 10, 1890. 2pp. Includes arguments for and estimates, requesting monies for the construction of a fog signal to be placed at Martin’s Industry Shoal. Includes description of the light-vessel there and a number or near-misses, and the proposed and the needs of the station. $14. 20485 & 20471. H. R. Report. LIGHTHOUSES AND OTHER AIDS TO NAVIGATION. 1892. 15 pp. Details estimates for construction on the Great Lakes in the coming year including new light stations and depots, keeper’s dwellings, new light vessels, tenders, oil houses, fog signals, repairs to stations and more. Includes good detail on a number of station improvements and additions across the country. $38. 476. H.R. Ex. Doc. No. 9. PERSONAL LOSSES SUSTAINED BY CERTAIN LIGHT-HOUSE EMPLOYEES. Dec. 4, 1893. 11pp. Seeks reimbursement to the keepers and assistants of 20 light stations in the Sixth District for personal possessions lost during the cyclone of August 27-28, 1893. Report lists the items, with a report by each keeper involved. $22. 6246. H. R. Doc. No. 4. SALARIES OF LIGHT KEEPERS. A Communication from the Chairman of the Light-House Board Submitting an Estimate of Deficiency. March 25, 1898. 2pp. Due to the establishment of twenty additional light stations, requests additional amounts to pay keepers. Provides information as to salaries and appropriations. $16. 7226. H. R. Doc. No. 602. NEW LIGHT VESSEL FOR THE FIFTH LIGHT-HOUSE DISTRICT. April 14, 1900. 2p. Request to Congress for an appropriation to replace the L. H. Tender Bramble due to its age and disrepair. Although the titles state ‘light vessel’, it appears that the use will be as a tender. $12. 9192. H. R. Report No. 66. LIGHT-HOUSE KEEPER’S DWELLLING AT CALUMET HARBOR [LAKE MICHIGAN]. January 18, 1902. 2p. Reports on the need for the above station and requests an appropriation for same. $26. 20478. H. R. Document No. 441. LIGHT-HOUSE DISTRICTS. March 6, 1902. 2p. Recommends passage of a bill to increase the number of districts to eighteen. The new districts are to include Alaska, Puerto Rico, etc. Includes a brief history of the area and describes the need. $12. 5245. H.R. Report No. 419. LIGHT-HOUSE AND FOG SIGNAL, BURROWS ISLAND, WASHINGTON. February 5, 1902. 1pp. Begs to establish said light at a cost not to exceed $15,000. $10. 20188. H. R. Report No. 374. LIGHT-HOUSE DEPOT NEAR DULUTH, MINN. February 8, 1902. 2p. Reports on the need for a depot in the area fue to the increase in the number of buoys required, with a description of the proposed location at the light-house reservation at Minnesota Point, and requests an appropriation for same. $18. 20189. H. R. Report No. 157. LIGHT VESSEL NEAR ORFORD REEF, OREGON. December 18, 1903. 2p. Reports on the need for a light vessel off Cape Blanco and requests an appropriation of $120,000 for said vessel. Includes a description of the proposed station and the area. $22. 20257. Senate Report No. 20. LIGHT-HOUSE AND FOG SIGNAL AT DIAMOND SHOAL, [NORTH CAROLINA]. December 10, 1903. 8p. Bill presents an amendment authorizing Albert F. Eells of Boston, to construct in thirty feet of water at the outer side of the outer Diamond Shoals. Report goes on to discuss the light-ship presently on station and the failure of previous contractors to erect such a lighthouse. Presents a number of arguments for such a lighthouse as well as petitions for and against same. $22. 9190a,b. H. R. Report No. 1973. LIGHT-HOUSE AND FOG SIGNAL STATION, BELLINGHAM BAY, WASHINGTON. March 29, 1904. 2p. Reports on the need for the above station and requests an appropriation for same. $22. 9191b. H. R. Report No. 1975. LIGHT AND FOG SIGNAL, ON ROCK OF AGES, LAKE SUPERIOR. March 29, 1904. 2p. Reports on the need for the above station and requests an appropriation for same. $22. 9189. H. R. Report No. 1974. LIGHT AND FOG SIGNAL, BLACK LEDGE, NEW LONDON HARBOR, CONNECTICUT. March 29, 1904. 2p. Reports on the need for the above station and requests an appropriation for same. $26. 2005b,c,d. H. R. Report No. 2089. LIGHT-HOUSE AND FOG SIGNAL AT DIAMOND SHOAL, NORTH CAROLINA. March 31, 1904. 14p. Bill presents an amendment authorizing Albert F. Eells of Boston, to construct in thirty feet of water at the outer side of the outer Diamond Shoals. Report goes on to detail the construction and design of the proposed structure, along with performance requirements. Also presented are arguments both for and against the lighthouse, and for a light or vessel further out to sea. Appended is a minority report arguing against the proposed bill, and the light structure as proposed. $22. 20490. H. R. Report No. 3775. LIGHT-HOUSE, ETC., AT MIDWAY ISLANDS. January 21, 1905. 2pp. Recommends passage of a bill to provide a light-house at the above location. Includes a brief history of the area and describes the need. $9. 20481. H. R. Report No. 4812. ADDITIONS TO THE LIGHT-HOUSE ESTABLISHMENT. February 21, 1905. 11 pp. Details estimates for construction in the coming year including new light stations and depots, keeper’s dwellings, new light vessels, tenders, oil houses, repairs to stations and more. Includes good detail on a number of station improvements and additions across the country. $28. 20465. H. R. Report No. 4251. ADDITIONS TO THE LIGHT-HOUSE ESTABLISHMENT. May 17, 1906. 22 pp. Details estimates for construction in the coming year including new light stations and depots, keeper’s dwellings, new light vessels, tenders, oil houses, repairs to stations and more. Includes good detail on a number of station improvements and additions across the country. $32. 20488. Senate Report No. 128. INCREASE IN THE NUMBER OF LIGHT-HOUSE DISTRICTS. January 11, 1906. 2p. Recommends passage of a bill to increase the number of districts to nineteen. The new districts are to include Alaska, Puerto Rico, Hawaiian Islands, Midway, etc. Includes a brief history of the area and describes the need. $12. 20199. H. R. Report No. 244. LIGHT-HOUSE, AND FOG SIGNAL ON KARQUINES STRAIT, CALIFORNIA. January 18, 1906. 1p. Reports on the need for a light-house and fog signal, with a description of the proposed station, and requests an appropriation for same. $16. 7362. Senate Report No. 800. FOG-SIGNAL STATION, ISLE AU HAUT HARBOR, MAINE. February 8, 1906. 2p. Recommends the establishment of a light and fog-signal station at Robinson Point, Isle au Haut Thorofare, Maine, and requests an appropriation of $14,400 be made. $12. 7363. Senate Report No. 2379. LIGHT AND FOG SIGNAL IN NEW YORK BAY, NEAR GREENVILLE, N.J. April 5, 1906. 1p. Recommends the establishment of the above light and fog-signal. $10. 5252d. H. R. Doc. No. 19. WHALE'S BACK LIGHT-HOUSE. December 11, 1837. 7pp. Reports on proposals by engineers Winslow Lewis and Calvin Knowlton to protect the deteriorating foundation of the lighthouse, with condition reports and cost estimates. $12. 5248b,c,d,e. H.R. Doc. No. 21. LIGHT-HOUSES SOUTHERN COAST. December 11, 1837. 6pp. A report of the Coast south of the Chesapeake, with a view to the establishment of Light-Houses, &c. Includes recommendations for the following lights and light-boats: Eggmont Key, Key West, Love Key, Sombrero Key, Indian Key, Mosquito Bank, Triangle Shoal, Soldier Key, Cape Florida, St. Simon's Sound (all FL) , Sullivans Island (NC) plus four others, Wilkinson's Point. $12. 8463. H. R. Doc. No. 27. LIGHT-HOUSES, BUOYS, &c., December 14, 1837. 27p. Contains a complete listing of lighthouses and beacons with the number of lamps lit as of the first day of January, 1833. Also contains an extensive account of approved and rejected light-house construction projects in the states of Maine, New Hampshire, Mass., Conn., Rhode Island, New York, Jew Jersey, Penn., Del., Maryland, Virginia, North and South Carolina, Georgia, Alabama, and Great Lakes, etc. Extensive early information. $32. 4746b. REPORT FROM THE SECRETARY OF THE TREASURY IN COMPLIANCE WITH A RESOLUTION OF THE SENATE OF THE 25TH INSTANT, TRANSMITTING COPIES OF THE PRESENTATIONS MADE TO HIM RELATIVE TO THE LIGHT-HOUSES OF THE UNITED STATES, BY THE MESSRS. BLUNT....Senate No 138. January 26, 1838. 107pp. Reports by the respected publisher of Coast Pilots of the day, regarding the poor management of the light-house establishment, with considerable information relative to the efficiency and operation of lights throughout the country. $68. 6772. H. R. Doc No. 131. CONTRACTS - LIGHT-HOUSES, [floating lights, beacons, buoys, stakeages, ]&c. January 31, 1839. 5p. A complete listing of contracts, contractors and costs for building and for repairs to various light stations. Includes Pottawatamie [MI], Montauk, Lake Pontchartrain [LA], Stratford Point LV, Long Shoal [NC], Sandy Hook LV, Salmon Rover, Lake Champlain, Key West LV, Georgia, Sand Island [AL], and many, many more. $24. 465c,d,e,f. H.R. Doc. No. 158. BUILDING LIGHT-HOUSES, LIGHT-BOATS, BEACONS, &c. February 6, 1839. 19pp. Includes recommendations on Whale-back Light, Plymouth Gurnet Light, Chatham Twin (wooden) Lights, Louis McClain Light-boat (lost in a gale with all hands) and others. $28. 6549c. H. R. Doc. No. 187. R.T. PAINE - LATITUDE AND LONGITUDE OF LIGHTHOUSES IN MASSACHUSETTS. February 13, 1839. 5p. In response to a request by S. Pleasonton, R. T. Paine measured and hereby reports on the locations of Massachusetts lights. Also included is information regarding heights of lamps and visible distances of said lights. $20. 499 (7). Senate Doc. No. 474. May 18, 1840. 13pp. Report examining communications by Mr Henry Lapaute (French constructor of lenticular lanterns) to Mr. Davis of the Senate, subsequent to the arrival in the United States of two lenticular lights from France, to be tried at Sandy Hook and at Isle of Shoals. Report chronicles observations of similar lights, operating characteristics, etc. Also includes tables of range of light, and oil consumption of many U.S. lights. $12. 4113. H.R. Doc No 193. APPROPRIATIONS FOR LIGHT-HOUSE ON FLYNN'S KNOLL. letter From the Secretary of War Transmitting a report of the amount of money expended of the Appropriation made for the Erection of a light-house on Flynn's Knoll. April 20, 1842. 38pp. Gives complete itemized accounting of items used in the construction of the light to date. Speaks also of a gale in 1841 which destroyed all the work completed to that date. $44. (See also #4111). 5250d. Senate 619. July 20, 1840. 12pp. Report of Captain M.C. Perry, in relation to Light-houses of England and France. Provides a synopsis of the establishment, apparatus and management of British and French lights. $22. 2172. H. R. Doc. No. 178. [LIGHT-HOUSE] CONTRACTS AND PAYMENTS AT THE TREASURY. April 8, 1842. 16p. Includes one page table detailing contracts made relative to light-houses, floating lights, beacons, buoys, etc. Included are contracts for: refitting Thatcher’s Island two light-houses by Winslow Lewis; Scituate Light, Chatham Light; Cape Henry Light; Tybee Island Light; Old and New Point Comfort; delivery of oil to light-houses; and more. $16. 494 (3). Senate No 95. RESOLUTION OF THE GENERAL ASSEMBLY OF INDIANA, IN FAVOR OF THE ERECTION OF A LIGHT-HOUSE AT CITY WEST ON LAKE MICHIGAN.February 6, 1844. 1pp. $8. 304-(21). Senate No. 166. 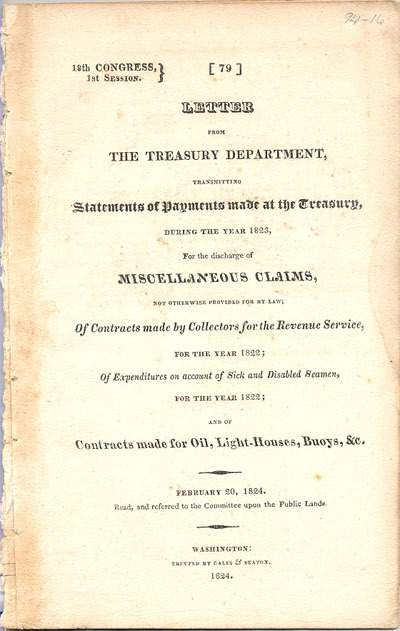 "REPORT of THE SECRETARY OF THE TREASURY communicating THE RESULT OF AN EXPERIMENT TO ASCERTAIN THE EXPEDIENCY OF USING GAS, INSTEAD OF OIL, IN THE LIGHT-HOUSE ESTABLISHMENT." May 24, 1844, 41pp. Very interesting historical reading about the continual search for brighter and more efficient fuels. Conbtains a great deal of technical data on fuels and burners at a time when equipment was rapidly changing. A worthwhile reference. $16. 448a,b. Senate Doc. No. 41. REPORT FROM THE SECRETARY OF THE TREASURY IN ANSWER TO A RESOLUTION OF THE SENATE OF DECEMBER 18, 1845, RELATIVE TO THE ERECTION OF A LIGHT-HOUSE NEAR FORT MIFFLIN, IN THE DELAWARE RIVER. January 7, 1846. 4pp. $12. 4372c. Senate No. 488. REPORT OF THE SECRETARY OF THE TREASURY ON THE IMPROVEMENTS IN THE LIGHT-HOUSE SYSTEM AND COLLATERAL AIDS TO NAVIGATION. Wash. August 5,1846. 278pp. Offers a complete report of the light-house systems in Great Britain including England, Scotland, Ireland, Holland, Belgium, Denmark, France, in an effort to offer suggestions for improvements to the system of the United States. Includes Instructions to Keepers, construction and operations. Very comprehensive. $64. 6806a,b,c,d,e,f,g. Senate 129. RESOLUTION OF THE LEGISLATURE OF FLORIDA, RELATIVE TO THE ERECTION OF A LIIGHT-HOUSE AT NEW SMYRNA. February 8, 1847. 1p. $4. 713a,b,c,d,e,f. Senate No. 130. RESOLUTION...RELATIVE TO THE ERECTION OF A LIGHT-HOUSE ON EGMONT KEY [Florida]. February 8, 1847. 1p. $3. 6807a,b,c,d,e,f,g. Senate 131. RESOLUTION OF THE LEGISLATURE OF FLORIDA, RELATIVE TO THE ERECTION OF A LIIGHT-HOUSE AT INDIAN RIVER BAR. February 8, 1847. 2p. $4. 6808a,b,c,d,e,f,g. Senate 132. RESOLUTION OF THE LEGISLATURE OF FLORIDA, RELATIVE TO THE ERECTION OF A LIIGHT-HOUSE AT SWANNEE RIVER. February 8, 1847. 2p. $4. 5257 (6). Senate 162. Resolutions of The Legislature of Maryland, in relation to The Erection of a LIGHT-HOUSE ON DRUM POINT, PUTUXENT HARBOR (CHESAPEAKE BAY). February 20, 1847. 1pp. $2. 5300b,c,d. H. R. Ex. Doc. No. 6. COMMUNICATION...SHOWING WHAT HAS BEEN DONE...FOR BUILDING LIGHT-HOUSES, LIGHT-BOATS, &C. December 31, 1849. 11pp. Reports on the construction of approximately 45 lights around the country. $12. 4745. LIGHT-HOUSE ESTABLISHMENT. LETTER FROM THE SECRETARY OF THE TREASURY TRANSMITTING A COMMUNICATION FROM THE FIFTH AUDITOR OF THE TREASURY, SHOWING WHAT HAS BEEN DONE UNDER THE PROVISIONS OF THE ACTS OF 14TH AUGUST, 1848, AND 3D MARCH, 1849, FOR BUILDING LIGHT-HOUSES, LIGHT-BOATS, &c. H.R. Ex. Doc. No. 6, December 31, 1849. 11pp. Lists by state and light station the construction and maintenance performed on 47 lights. $36..
5260a,b. Senate Misc. No. 100. Resolution of the Legislature of Texas, in favor of An Appropriation for a LIGHT-HOUSE OR LIGHT-BOAT AT BRAZOS SANTIAGO AND THE MOUTH OF THE RIO GRANDE. April 17, 1850. 1p. $3. 7227. Ex. Doc No. 2. General Expenses of Light-Houses, &c. during the year ending June 30, 1850. 28p. Includes tables of oil required for use in light-houses, general expenses by state, with Superintendents, complete list of light-houses as of 1848 with number of lamps, floating lamps, and annual salaries. $75. 435f. (annual) "REPORT OF THE GENERAL SUPERINTENDENT OF THE LIGHT-HOUSE ESTABLISHMENT" (for the year 1850) dated December 20, 1850, 94pp. Disbound. Very complete report with detailed descriptions of each light house, the name of the keeper, equipment on hand, oil usage, defects and repairs needed, etc. These early reports were contained within Congressional Documents and contain a wealth of information on the condition of all of the stations before the inception of the Lighthouse Board. Submitted by S. Pleasonton. $64. 9221b. Doc. No. 1. REPORT OF THE COLONEL OF THE CORPS OF TOPOGRAPHICAL ENGINEERS FOR THE YEAR 1850…ERECTION OF LIGHTHOUSES AT SAND KEY, FL., CARYSFORT REEF, FL, WAUGOSHANCE, MI., WHALE’S BACK, NH., BRANDYWINE SHOAL, DE., MINOT’S ROCK, MA. November 14, 1850. 74p. A most interesting report on investigations and construction of the above lighthouses with considerable detail into the construction process and difficulties encountered. Most interesting is the description, in detail of the construction of the iron lighthouse at Minot’s Ledge and investigation into it’s condition the following year. The writer notes that "…I was much gratified to find on my arrival that all appeared well…and I satisfied myself that the structure was in good condition as it was [when built]….I call to your attention a matter less agreeable…Various idle rumors and some ill-natured and vindictive reports have been circulated for some time in regard to the alleged insecurity of the Minot Light…." The next year the light would succumb to the "alleged insecurity" denied by the inspecting engineer. Most interesting reading and important information. (Photocopy $15.80). 7355a,b,c. H. R. Doc. No. 43. A LIST OF LIGHT-HOUSE CONTRACTS, &c. February 4, 1852. 7p. Provides a complete listing of contracts for erecting and repairing various lighthouses for the year 1851, including a report by Professor Bache. Also includes reports relative to light-houses at Aransas Pass in Texas, Holmes Hole in Mass., Mouse Island in Lake Erie, and for removal of beacon light from Sodus Pier to Grassy Point, in Lake Ontario. $18. 3151b. H. R. No. 88. LETTER FROM THE SECRETARY OF THE TREASURY TRANSMITTING A COMMUNICATION FROM THE FIFTH AUDITOR OF THE TREASURY RESPECTING THE LIGHT-HOUSE SYSTEM OF THE UNITED STATES, IN REPLY TO A REPORT MADE TO THE CONGRESS BY THE LIGHT-HOUSE BOARD. March 23, 1852. 82pp. This is a reply by Fifth Auditor of the Treasury Stephen Pleasonton (also known as "Superintendent of Lighthouses") to the large 760 page report issued in 1851 by the Light-House Board. In this reply Mr. Pleasonton defends his administration and attempts to answer several of the criticisms contained in the 1851 report, as well as show the merits of the Light-House Establishment. $65. 308a. "LETTER from the SECRETARY OF THE TREASURY, transmitting A REPORT FROM THE LIGHT-HOUSE BOARD,..."July 7, 1852, 72pp. Quite a lengthy and detailed answer directed at the Fifth Auditor, citing "grave errors" in his recent report to the Board, and answering questions posed in the report of January 1852. Contains much information relating to equipment, facilities and practices within the Light-House Service.) $43. 9194. H. R. Doc. No. 2. Oil required for Lighthouses on the Atlantic, Gulf and Lake Coasts during the Fiscal Year ending 30th June, 1854, General Expenses of Light-Houses, Light-boats, beacons…, List of Lighthouses in the United States in October 1852, Estimates for the Support of Light-Houses, &c…. 37p. Quite detailed early information includes list of all existing light-houses, number of lamps, number of keepers, salary, superintendents, expenses, oil and supplies required, proposed new lights and expenses, and more. Disbound from Coast Survey, Report of Finances. $58. 9272. Senate Rep. Com. No. 362. MEMORIAL [claim] OF ANN DUDLEY. KEEPER OF ST. MARKS LIGHT-HOUSE, FLORIDA. 1p. December 29, 1852. Reports on a claim by Keeper Dudley for personal possessions and improvements lost at the light-house as a result of the gale of August 1851. Report describes the losses to the keeper, and to the orher citizens of the area, but reports that the government was not responsible and submits that no remuneration should be given. $18. 9269. Senate Rep. Com. No. 78. CONTRACTS AND CONSTRUCTION OF A LIGHT-HOUSE ON EXECUTION ROCKS, LONG ISLAND SOUND. 3p. February 2, 1854. Report provides testimony regarding a discrepancy in the construction of the foundation for the lighthouse, in which hewn granite was substituted for split granite. The report describes the work and conditions, and the methods of payments and inspection of said work by the Light-House Establishment, and after consideration of the evidence recommends that the bill for extra charges incurred be paid. $22. 7356. Senate No. 433. REPORT… PRAYING COMPENSATION FOR LABLR AND MATERIALS … FOR CONSTRUCTION OF A LIGHT-HOUSE AND DWELLING-HOUSE ON BIG THUNDER BAY ISLAND, IN LAKE HURON. January 25, 1855. 2p. Reports on the controversy regarding payment of the contractor for construction of said light, as the structure was in an unwise and injudious site, and was blown away in a gale before completion. $14. 5319a,b. H. R. Ex. Doc. No. 54. LIGHT-HOUSE BOARD - ADDITIONAL ESTIMATES FOR OIL. February 6, 1855. 3pp. Notes contracts and usage of oil and that, due to a great advance in the price of sperm oil, additional monies will be needed. $13. 4398a. H.R. Doc. No. 127. ESTIMATES--LIGHT-HOUSE SERVICE. June 21, 1856. 13pp. Transmits estimates to meet the wants of the Service arising from damage occurring during the past winter, with recommendations and descriptions of damages to various light stations around the country. As always, a nicely detailed report. $44. 2171. H. R. Ex. Doc. No. 12. ESTIMATE – LIGHT-HOUSE WORKS AT COFFIN’S PATCHES. December 16, 1856. 4 pp. Details estimates for restoring the light-house structure at Coffin’s patches, Florida destroyed by the hurricane of August 27-28. Includes detailed piece-by-piece estimate for the repair work, totaling $29,053.81. A good reference on lighthouse construction and repair. $20. 3172.a,b EXPENSES OF THE LIGHT-HOUSE SERVICE - NORTHWESTERN LAKES. LETTER FROM THE SECRETARY OF THE TREASURY IN ANSWER TO A RESOLUTION OF THE HOUSE OF REPRESENTATIVES CALLING FOR INFORMATION IN REFERENCE TO CERTAIN EXPENSES OF THE LIGHTHOUSE SERVICE ON THE NORTHWESTERN LAKES. April 13, 1858, HR Exec. Doc. No 101. 10pp. Includes list of lights in the 11th LH District along with repair and expense information. $33. 6148. Senate Ex. Doc. No. 53. MESSAGE FROM THE PRESIDENT OF THE UNITED STATES IN RELATION TO POINTS UPON THE COASTS OF OREGON, WASHINGTON TERRITORY, AND ALASKA, FOR LIGHT-HOUSES. February 24, 1869. 12pp. Lists locations reserved on the west coast for light-stations and possible additional sites. $22. 454a,b,c. Senate Doc No. 56. PETITION OF CITIZENS OF TEXAS, PRAYING THE ERECTION OF A LIGHT-HOUSE ON OR NEAR...THE HARBOR OF GALVESTON, AND THE RESTORATION OF THE LIGHT-VESSEL LATELY REMOVED....April 30, 1860. 15pp. Includes shipping information and testimony to the need of the light-vessel. $44. 9270. H. R. Report No. 327. MILWAUKIE LIGHT-HOUSE. 3p. April 2, 1860. Report makes a recommendation for a new taller lighthouse with attached keeper’s dwelling at or near the north cut of the harbor at Milwaukie, Wisconsin. The present light has been deemed inadequate due to its low height confounding it with shipping and other area lights, and due to the fact that the long pier on which it sits is inaccessible by the keeper during storms when it is needed most. Interesting account. $24. 9161b. Senate Mis. Doc. No. 61. March 6, 1862. LETTER OF WM. 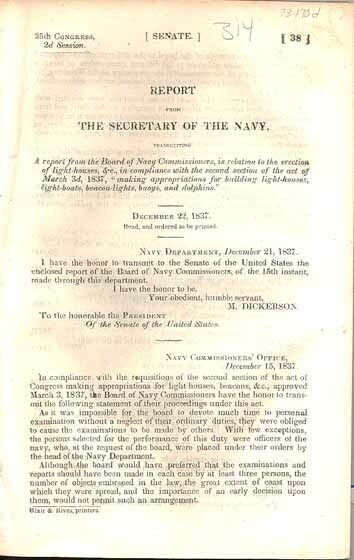 B. SHUBRICK [Chairman Light-House Board] TRANSMITTING A REPORT OF THE LIGHT-HOUSE BOARD IN RELATION TO THE TRANSFER OF THE LIGHT-HOUSE ESTABLISHMENT TO THE NAVY DEPARTMENT…. 18p. Quite a lengthy reply and discussion of the recent bill proposed to reorganize the Navy Department and transferring to it the duties and functions of the Light-House Board. Includes a detailed discussion of the origins and functions of the Light-House Establishment, including a most interesting 6-page table comparing the operation of the establishment prior to the formation of the Board in 1852, with the present state of the establishment. Quite interesting for research and reading. $26..
7358. Senate Doc. No. 34. RE-ESTABLISHMENT OF LIGHT-HOUSES AT CAPE FLORIDA, JUPITER INLET AND CAPE CANAVERAL, FLORIDA. January 12, 1866. 1p. Reports on the work relating to these three lights. $12. 469b. H.R. Doc. No. 237. LIGHT-HOUSE AT AU SABLE RIVER-Letter from the Secretary of the Treasury Transmitting a Communication from the Light-House Board relative to the erection of a light-house at the mouth of the Au Sable River. March 28, 1868. 2pp. Document relates to individual appropriations to finish the pier, erect a light-house on the end and erect a keepers dwelling on shore. $11. 7361b. H. R. Doc. No. 268. LIGHT-HOUSE AT PORT AUSTIN [MICHIGAN]. April 27, 1868. 3p. Reports upon the petition for the above light-house and a harbor of refuge. $10. 20480. Senate Report No. 605. LIGHT-HOUSE SERVICE. February 4, 1875. 11p. Report looks at the administration of the Light-House Establishment and the present state of their technology and operating practices, and proposes various changes. Such changes include modifications in the make-up of the Light-House Board, confining the executive duties to two persons, reducing the number of inspectors in each district, placing the operation of buoys, etc under the Revenue marine, and much more. It would seem that many of these recommendations were never approved but the report provides a unique insight into the inner workings of the Light-House establishment. $32. 20487. H. R. Report No. 11. MANN’S MARINE DANGER SIGNAL. June 4, 1879. 3p. Reports on an automatic signal at sea which by means of the action of the water on reefs and shoals would ring a bell or force air from a whistle. Discusses the operation and requirements of this new signal at great length and in some detail, including a similar device in use at the Graves in Boston Harbor. $10. 4424. Morton, Prof. Henry (Member of the Light-House Board). REPORTS ON THE TOPOPHONE AND THE ELECTRIC LIGHT. Appendix to the Annual Report of the Board for the year ending June 30, 1879. Wash. GPO. 1880. 50pp. Soft wraps intact but some staining, minor chips. In addition to reporting on the theory and construction of the Topophone to aid navigators in determining the position of distant fog signals, reports on experiments with machines for producing electric light, with possible future application to Light-House illumination. $98. 7357. Senate Doc. No. 118. REPORT REGARDING THE PINTSCH LIGHTED BUOY AT THE ENTRANCE OF THE HARBOR OF NEW YORK. February 23, 1882. 2p. Reports on the satisfactory operation of the gas lighted buoy during the year are recommends the further use of gas lighted buoys. $10. 8329. Senate Ex. Doc. No. 135. LETTER FROM THE SECRETARY OF THE TREASURY WITH COPYS OF REPORTS ON EXPERIMENTS RELATIVE TO THE MERITS OF LIGHTING HARBORS, &C BY COMPRESSED GAS; ALSO REGARDING THE WORKING OF THE INVENTION OF JOHN M. FOSTER…WITH DRAWINGS….. March 15, 1882. 12pp. with 7 large fold-out plates detailing the buoys and gas operated lamps and compressors. Offers detailed descriptions as to the operation and construction of the gas-lighted buoys with drawings and specifications. $39. 20460. H. R. Report No. 1074. FOG SIGNAL AT POINT ROBINSON, WASHINGTON TERRITORY. April 20, 1882. 2pp. Recommends passage of a bill to provide a fog signal at the above location. Includes a brief history of the area and describes the need. $14. 20459. H. R. Report No. 1068. LIGHTS ON THE ATCHAFALAYA RIVER, LOUISIANA. April 18, 1882. 1pp. Recommends passage of a bill to extend the jurisdiction of the Light-House Board over the above river. Includes a brief history of the area and describes the need. $12. 5255b. Senate Ex. Doc. No. 183. LETTER OF THE LIGHT-HOUSE BOARD WITH COPY OF REPORT ON EXPERIMENTS RELATIVE TO THE FOSTER SYSTEM OF GAS-LIGHTED BUOYS. June 9, 1884. 9pp. Offers detailed descriptions as to the operation and construction of the gas-lighted buoys. $24. 777a. Senate Ex. Doc. No. 194. Recommendation of the Light-House Board for the Removal of Croatan Light [North Carolina] from its present location to Eight-foot Knoll, North Carolina. June 23, 1884. 2p. States the case for removal of said light. $12. 444. H.R. Report No. 1147. ADDITIONAL LIGHT-HOUSE DISTRICTS. March 18, 1886. 1pp. Makes recommendations to split the 15th L.H. District to form a new 16th District, and to split the 11th L.H. District to form a new 17th District. $10. 7359. H. R. Doc. No. 137. LIGHT-HOUSE AT GRAND ISLAND, MISSISSIPPI. March 25, 1886. 2p. Requests an appropriation of $8000 to build a light-house on Grand Island in place of one now on Saint Joseph’s Island, Mississippi. $10. 445. H.R. Doc. No. 269. REPAIRS TO LIGHT-HOUSES. LETTER FROM THE ACTING SECRETARY OF THE TREASURY TRANSMITTING A COMMUNICATION FROM THE LIGHT-HOUSE BOARD SUBMITTING AN AMENDMENT TO THE ANNUAL APPROPRIATION FOR REPAIRS OF LIGHT-HOUSES. June 11, 1886. 2pp. $11. 2009b. H. R. Report No. 5882. COST OF FIVE LIGHT-HOUSE TENDERS. January 7, 1907. 3p. Report details the cost of five light-house tenders, one each for the third district, sixth district, eleventh district, twelfth district, and the thirteenth district. Though prior appropriations had been made, delays and higher than expected bids necessitated increased appropriations requested in this report. Also noted was the sinking in a collision of the tender Manzanita in the thirteenth district. $24. 20468. Senate Report No. 6512. ADDITIONAL AIDS TO NAVIGATION IN LIGHT-HOUSE ESTABLISHMENT. February 9, 1907. 9 pp. Details estimates for construction in the coming year including new light stations and depots, keeper’s dwellings, new light vessels, tenders, oil houses, repairs to stations and more. Includes good detail on a number of station improvements and additions across the country. $20. 20479. H. R. Report No. 1116. ADDITIONAL AIDS TO NAVIGATION AND BUREAU OF LIGHT-HOUSES. April 26, 1910. 49 pp. Details estimates for construction in the coming year including new light stations and depots, keeper’s dwellings, new light vessels, tenders, oil houses, repairs to stations and more. Includes good detail on a number of station improvements and additions across the country. $32. 2008. Senate Report No. 679. CHANGE IN LOCATION OF LIGHT VESSEL ON FRYING PAN SHOALS, N. C., April 26, 1912. 12p. In addition to recommending against the changing of location of the light vessel on Frying Pan Shoals, this interesting report details construction and distribution of tenders and light vessels in various districts; moving the fog signal and building a keeper’s dwelling at Great Salt Pond Light Station in Rhode Island; establishing a light and fog signal at Goose Island Flats in the Delaware River; reestablishment of a light and fog signal marking Thimble Shoals, Chesapeake Bay, Virginia; lighting the Cape Fear River; purchase of a site for a Lighthouse Depot in Charleston, SC. ; and much more. $18. 2007. H. R. Document No. 1323. PURCHASES BY THE COMMISSIONER OF LIGHTHOUSES … FOR THE FISCAL YEAR ENDED JUNE 30, 1912. GPO. January 31, 1913. 39p. Listed as Part II of the Annual Report of the Commissioner of Lighthouses for the fiscal year ended June 30, 1912, and contains a complete listing by District of each and every purchase made, the date, reason and amount. Includes everything from touring car for investigating committee to water, nails, pipe flanges, pane glass, medicine, provisions, wicks, laundering, fire extinguishers, typewriters, coal, repairs to Light-House Tenders, tableware, fresh water, oil cans and lamps, and much more. $38. 20472. Senate Report No. 1285. AIDS TO NAVIGATION. February 21, 1913. 11 pp. Details estimates for construction in the coming year throughout the LH Districts including new light stations and depots, keeper’s dwellings, new light vessels, tenders, oil houses, repairs to stations and more. Includes good detail on a number of station improvements and additions across the country. $26. 20476. Senate Report No. 180. AIDS TO NAVIGATION IN THE LIGHTHOUSE SERVICE. January 26, 1914. 3 pp. Details estimates for repairs and construction in the coming year at the light stations at Point Vincente, Calif., Improvements at Point Pinos, Calif., and Goat Island, Calif., s $22. 20470. H. R. Report No. 1213. AIDS TO NAVIGATION IN THE LIGHTHOUSE SERVICE. December 12, 1914. 10 pp. Details estimates for construction in the coming year including new light stations and depots, keeper’s dwellings, new light vessels, tenders, oil houses, repairs to stations and more. Includes details on stations in CA., FL., MA., MI., NY., LA., OH., WA., OR., HA., ME., NJ., DE. and more. Includes good detail on a number of station improvements and additions across the country. $22. 20474. Senate Report No. 851. AIDS TO NAVIGATION IN THE LIGHTHOUSE SERVICE. January 4, 1915. 12 pp. Details estimates for construction in the coming year including new light stations and depots, keeper’s dwellings, new light vessels, tenders, oil houses, repairs to stations and more. Includes stations in Maine, NY, PA., DE., FL., TX., LA., OH., MI., WA., OR., CA., HA., and more. Includes good detail on a number of station improvements and additions across the country. $22. 20466. H. R. Report No. 552. AIDS TO NAVIGATION, LIGHTHOUSE SERVICE. April 15, 1916. 14 pp. Details estimates for construction in the coming year including new light stations and depots, keeper’s dwellings, new light vessels, tenders, oil houses, repairs to stations and more. Includes good detail on a number of station improvements and additions across the country. $22. 20473. Senate Report No. 495. AIDS TO NAVIGATION IN THE LIGHTHOUSE SERVICE. May 18, 1916. 10 pp. Details estimates for construction in the coming year including new light stations and depots, keeper’s dwellings, new light vessels, tenders, oil houses, repairs to stations and more.. Includes good detail on a number of station improvements and additions across the country. $22. 20489. H. R. Doc. No. 704. ESTIMATES OF APPROPRIATIONS FOR THE LIGHTHOUSE SERVICE. January 3, 1918. 15 pp. Details estimates for construction in the coming year including new light stations and depots, keeper’s dwellings, new light vessels, tenders, oil houses, repairs to stations and more. Includes stations in Alabama, La., MI., Va.’ NY., Md. Includes good detail on a number of station improvements and additions across the country, addition of superintendents and more. $22. 20469. H. R. Report No. 1065. AIDS TO NAVIGATION IN LIGHTHOUSE SERVICE. February 13, 1919. 7 pp. Details estimates for construction in the coming year including new light stations and depots, keeper’s dwellings, new light vessels, tenders, oil houses, repairs to stations and more. Includes good detail on a number of station improvements and additions across the country. $18. 20498. H. R. Report No. 498. AIDS TO NAVIGATION. December 13, 1919. 12 pp. Details estimates for construction in the coming year throughout the LH Districts including new light stations and depots, keeper’s dwellings, new light vessels, tenders, oil houses, repairs to stations and more. Includes good detail on a number of station improvements and additions across the country. $28. 20467. H. R. Report No. 559. AIDS TO NAVIGATION AND FOR OTHER WORKS IN THE LIGHTHOUSE SERVICE. January 12, 1922. 12 pp. Details estimates for construction in the coming year including new light stations and depots, keeper’s dwellings, new light vessels, tenders, oil houses, repairs to stations and more. Includes good detail on a number of station improvements and additions across the country. $22. 2010. Senate Report No. 358. ONE HUNDRED AND FIFTIETH ANNIVERSARY OF THE LIGHTHOUSE SERVICE. May 2, 1939. 4p. Report recommends appropriations for a celebration of the one hundred and fiftieth anniversary of the establishment of the Lighthouse Service. Report details the history of the Service, and of some of the lighthouses and lightships, and notes that Postmaster General Farley has a commemorative stamp under consideration. $32. 20492. Senate Report No. 182. IMPROVEMENT AT THE SANTA CRUZ LIGHT STATION. January 26, 1914. 2pp. Recommends passage of a bill to provide improvements to the above light including a fog-signal building, new keeper’s quarters, etc. Includes a brief history of the station. $18. 9193. Senate Ex. Doc No. 33. …PROVIDING MORE EFFICIENT MEANS FOR THE PRESERVATION OF THE LIVES OF SEAMEN AND PASSENGERS WRECKED ON THE COASTS OF NEW JERSEY AND LONG ISLAND. January 31, 1857. 18p. A statement as to what has been done regarding appropriations for purchase of life-boats and establishing other means of assistance to mariners along the coasts, and for providing additional stations and Keepers along the coast, providing a Superintendent, etc. Includes extensive reports on various shore areas and the requirements of each, various wrecks and rescue attempts, and more. Important early report of the area. $64. 306a,b. Report "...TO PROMOTE THE EFFICIENCY OF THE LIFESAVING SERVICE." February 18, 1882, 5pp. (Reports on various House bills under consideration relating to the Lifesaving Service manning, stations, pay, etc.) $35. 9363. H. R. Report No. 1135. ADDITIONAL LIFE-SAVING STATIONS ON THE ATLANTIC COAST OF THE UNITED STATES. March 13, 1888. 1p. Recommends the establishment of a life-saving station on Fisherman’s Island in Virginia, and a second station on Fenwick’s Island, between Indian River Inlet and Ocean City. $14. 9368. H. R. Report No. 1330. LIFE-SAVING STATION ON NANTUCKET ISLAND, MASSACHUSETTS. March 27, 1888. 1p. Report recommends the establishment of a life-saving station on the southeast point of the island. This station, located on Great neck at Madaket, would be completed in 1891. $28. 9370. H. R. Report No. 3001. LIFE-SAVING STATION AT KEWAUNEE HARBOW, WISCONSIN. July 21, 1888. 1p. Short report recommends non-concurrence in the Senate amendment on the subject of erecting a life-saving station at Kewaunee Harbor, and requests a conference between the two groups. $9. 4396b. H.R. Report No. 154. LIFE-SAVING STATION, POINT BONITA, CALIFORNIA. January 28, 1896. 2pp with very nice fold-out chart showing proposed location. Proposes the establishment of said station, with testimony in favor. $50. 4397. H.R. Report No. 155. LIFE SAVING STATION AT MOUTH OF SIUSLAW RIVER, OREGON. January 28, 1896. 2pp. Reports on progress of appropriations bills for such a station, recent wrecks in the area and the continued need. $19. 7351. H. R. Report No. 610. LIFE-SAVING STATIUON AT SABINE PASS, TEXAS. March 13, 1900. 3p. Described the conditions and requests to move the station to a location more suited to the present day commerce. With testimony in favor and descriptions of conditions. $13. 9274. Kimball, S. I. REPORT … RELATIVE TO THE SERVICES PERFORMED BY THE GALVESTON, SAN LUIS, AND VELASCO LIFE-SAVING CREWS IN RESCUING AND SUCCORING VICTIMS OF FLOOD IN SOUTH-CENTRAL TEXAS IN DECEMBER, 1913. Senate Document No. 422. GPO. 1914. 20p. In the latter part of November 1913, unprecedented rains in the area caused the overflow of the Brazos and Colorado Rivers such that they inundated an area fully 40 miles wide and causing the loss of a number of lives as well as doing great damage. Report details the work of the life-saving crews during this period including the loss on one oarsman, and the rescue of hundreds of persons. Most interesting. $58. 4399. H.R. Doc. No. 39. A REPORT IN RELATION TO THE REVENUE MARINE SERVICE. December 17, 1845. 46pp. Presents a detailed statement of the vessels employed, those in course of construction, and an estimate of the expenditure thereon. $60. 6243. H. R. Doc. No. 52. ANNUAL REPORT OF THE OFFICE IN CHARGE OF THE REVENUE MARINE SERVICE. February 13, 1849. 3pp. This very early report of the Revenue Marine Service details the vessels employed in the service, those under construction or discontinued, expenses, stations, etc. Interesting details regarding the service include "...the Polk, from her dimmensions, was not sufficiently buoyant to carry the machinery she had, and was, therefore, worthless as a steamer, but has good dimensions for a sailing vessel." $38. 2169a,b. H. R. Ex. Doc. No. 254. REVENUE MARINE STEAMERS ON THE LAKES. April 12, 1872. 12p. Lengthy report details the Revenue Marine steamers that have been employed on the Great Lakes during the past season, with the duties and services performed, extent of cruising ground, assistance rendered to vessels and crews, , assistance rendered to sufferers of fire, condition and efficiency of each vessel at present, repairs necessary, and much more. Very rare to have such a detailed account of the Revenue Marine on the Great Lakes. $34. 20486. H. R. Ex. Doc. No. 103. INSPECTIONS BY LIGHT-HOUSE BOARD AND BUREAU OF REVENUE MARINE. March 8, 1882. Briefly reports on a number of inspections requested including a thorough examination of the hull and machinery of the Revenue Steamer Johnson, examination of the Revenue Steamer Moccasin, and the Revenue Steamer Perry. Details performance , hull condition, condition of machinery on above vessels, and more. $14. 99384. H. R. Report No. 1299. REVENUE CUTTER FOR NEW BERNE, NORTH CAROLINA. March 21, 1888. 2p. Report describes the state of the present Revenue Cutter Stevens in service in the New Berne area, and requests the above replacement. Report details the difficulties and repairs needed by the Stevens and requests an appropriation of $75,000. $18. This site is continually updated, this page last updated February 16, 2017 .